2. The Adventures of Odysseus . Both of these books retell the original classic stories of King Arthur and Odysseus' journey home after the Trojan War. (Rather self explanatory titles there, hmm?) Each tale is divided up into short, manageable chapters for young readers to consume or for an easy read aloud. These books are designed to introduce the younger audience to these ancient and well-loved tales, making the stories comprehensible and engaging. "Long ago, in the time before time, when the world was still filled with marvels, a fair green island lay beyond the Pillars of Hercules. In those days it had many names. Some called it Merlin's Isle, after the great enchanter who worked his magic upon the world in that time. Others called it the Island of the Mighty, because of the great heroes who dwelled there. 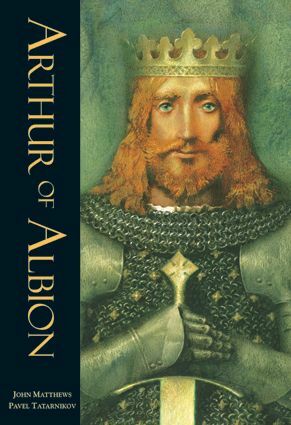 But most called it Albion, after a giant who had ruled there ages before. Albion was a land of many wonders. Dragons hid beneath the Hollow Hills by day and came out at night to light up the air with their flaming breath. The strange creature known as the Questing Beast roamed the land. It had the hide of a leopard, the haunches of a lion, the head and tail of a serpent and the feet of a hart. Only one man could capture it and he had not yet been born." The full-color illustrations by Pavel Tatarnikov take you back to medieval times. Of course, this paperback edition of the book is true Barefoot Books quality and I particularly love the glossy pages which give this book a special and classic feel to it. 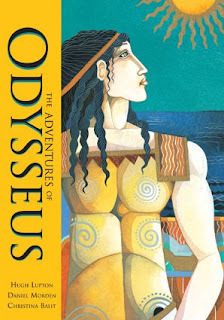 In The Adventures of Odysseus the people on the Island of Ithaca are awaiting the return of their king, Odysseus. Christina Balit provides the illustrations for this story and, once again, I think Barefoot Books chooses artist that would best describe and compliment the story. I love the style that Balit chooses to focus the reader on this piece of Greek mythology. What I perhaps find most intriguing about both of these books, and Barefoot Book's presentation of them, is that they specifically target fathers in using these books as read aloud stories with their children. I think one of the most special memories that we can make and share with our children are the stories that we share with one another (be it a real life and in-the-flesh adventure of our own making or the telling of a magnificent tale.) Moms do a lot of reading with their kids, but fathers have a harder time finding, well, time. Not trying to guilt the dads here by any means! I'm just saying that I appreciate that Barefoot Books recognizes the value of fathers reading to their children, and making a point to produce books that dads and sons, in particular, can bond over. Stories of adventure, magic and glory! I love it and the attitude behind it! So with all of that in mind, I present these two new titles to you, courtesy of Barefoot Books. Thanks, Barefoot, for sending these my way so that I could check them out! Both of these look really intriguing, and so different from one another visually. Definitely going to check them out.